Nero Man is a perfume by Benetton for men and was released in 2011. The scent is woody-spicy. The production was apparently discontinued. 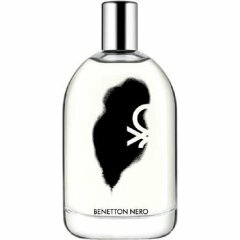 I just finished my first wearing with Benetton Nero. This one is going into my regular rotation for spring and summer fragrances. It is a very fresh and crisp fragrance that is easy to wear, inoffensive, and lasts a long time for an inexpensive one. The opening is a fairly sharp grapefruit, a lighter tangerine, a rich but delicate juniper berry and a hint of mint. It smells like a very refreshing summer gin drink to me. As it settles down, you start getting some of the woodiness, and a little sharp bite of nutmeg and patchouli. It's very comforting and very pleasant. Finally, it dries down to a soft woody musk skin scent that starts disappearing at the 10 hour mark. I was delighted with this scent for the price point. It smells wonderful, is nicely blended and it sticks for the entire day without being cloying or offensive. It's not a perfume masterpiece, but it's a very good scent that can be had for very little online. I would give it a sound 8 out 10. Write the first Review for Nero Man!